Recently I added another IT certification to my ever-growing list. It seems like lately I'm always studying for one certification or another. 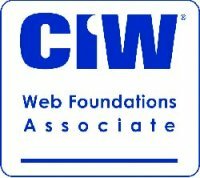 This time it was the CIW Web Foundations Associate. Ironically, it's more basic in the material covered than all the other certs I've already attained, but it is part of a larger plan and something I needed to knock out so I could keep moving.